Being a parent is a full time job. Nonetheless, on top of the substantial energy required to raise a child, most parents in the United States are also employed. According to the Bureau of Labor Statistics, among U.S. families that have children, 88.7% have at least one working parent. In 60.2% of those families both parents worked. Moving to a new city? Find out how much house you can afford. In recent years there’s been a movement to provide more resources and support to working parents. Four states (California, New Jersey, Rhode Island and Washington) now have paid family leave laws that require employers to grant workers paid time off for family emergencies or childbirth. Meanwhile, universal pre-k has been gaining public support in cities such as New York and Chicago and along the presidential campaign trail. Even in places that have moved to support working parents, however, there are a lot of challenges to those who are trying to raise a child while holding a job. Bad traffic, for example, takes on a whole different tenor when it means running late to pick your kid up from school. Likewise, a downturn in the job market is doubly stressful for workers who have extra mouths to feed. To find the best cities for working parents, SmartAsset analyzed data on 446 of the largest cities in the U.S. Along with the family leave policies in all 50 states, we considered metrics such as the cost of housing in each city, the average commute time, average childcare costs and the graduation rate at local schools. Our analysis considered nine metrics in total – read more about our methodology below. Utah rates well despite state policies. The Beehive State scored a zero for its policies on things like family leave and workspace accommodations for pregnant women. 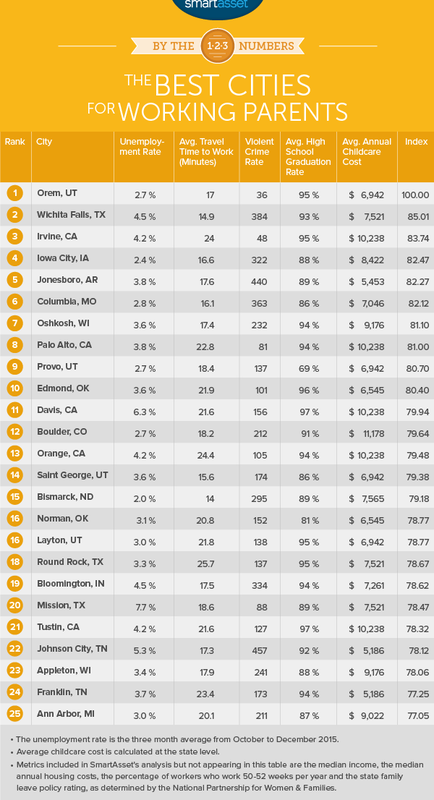 Nonetheless, two Utah cities rank in the top ten and four rank in the top 25 best cities for working parents. These cities all have low crime, low housing costs, good schools and strong job markets. Childcare in Utah is also relatively affordable, costing an average of $6,942 annually. California: best family leave policies, but most expensive. The Golden State is home to some of the most expensive parts of the country. Cities in the Bay Area and Southern California have some of the highest childcare costs and housing costs in the U.S. On the other hand, California received the highest possible rating for its family leave and other parent-friendly policies from the National Partnership for Women & Families. That’s a major reason five California cities rank among the top 25 best for working parents. College towns at the top. A number of college towns rank in the top 10, including places like Iowa City and Columbia, Missouri. The universities that serve as the largest employer in these cities often have family-friendly policies and offer more substantial vacation time to employees than workers in the private sector. This Utah city combines a relatively high quality of life for families with strong employment conditions for workers. It has the fourth-lowest crime rate of any city in SmartAsset’s analysis. Likewise, the average travel time to work of 17 minutes rates as the 33rd lowest. That leaves working parents with more time every day to spend with their kids. Meanwhile, the unemployment rate in Orem is just 2.7%, 10th lowest in our study. A strong employment market can mean that workers don’t have to stress about losing their job and can enjoy the time they spend with their kids. Median annual housing costs in this north Texas city add up to just $8,880, according to the U.S. Census Bureau. That includes expenses such as a mortgage payments, insurance costs and Texas property taxes, and it makes Wichita Falls the 32nd most affordable place in SmartAsset’s analysis. 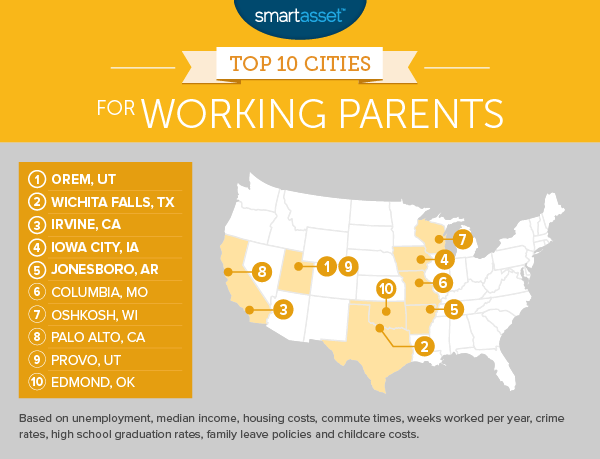 At the same time, Wichita Falls offers families a good school system, with an average graduation rate that places in the top 10% of the 446 cities in SmartAsset’s analysis. With several colleges and universities located within city limits, Irvine is one of California’s most well-educated cities. That is evident in the quality of local schools, which have an average graduation rate of 95%, 13th highest in SmartAsset’s study. Other reasons working parents may find Irvine to be the perfect place to raise a family are the city’s high median income (which at $90,743 rates as the 25th-highest in SmartAsset’s study) and California’s family-friendly policies. California was the first state to pass a paid family leave law to supplement the federal family leave law, which does not require employers pay workers who take family leave. Like Irvine, Iowa City is highly educated and home to a major university, the University of Iowa. It has the fourth-lowest unemployment rate of any city in SmartAsset’s analysis, at just 2.4%. Yet Iowa City also offers a small town atmosphere. The average commute time is just 16.6 minutes, 24th lowest in the U.S.
Arkansas has some of the lowest childcare costs in the nation. According to Child Care Aware of America, annual childcare costs at infancy are $5,894 on average while childcare costs for a toddler are $5,011. Those averages are less than half the cost of childcare in places like Massachusetts and Minnesota, where a year of childcare costs more than $12,000 on average. Located in central Missouri, Columbia is the quintessential Midwestern college town. Bolstered by the University of Missouri, it has a strong employment market, with unemployment at just 2.8%. Childcare in Missouri is also quite affordable, costing an annual average of $7,046. Find out now: where are America’s best college towns? Oshkosh is home to the headquarters of several major companies, most notably OshKosh B’Gosh, a popular children’s clothing brand. (The company is most well-known for making overalls for babies and toddlers.) While it has a strong economic environment – unemployment is just 3.6% – it is also fairly affordable. Median annual housing costs in Oshkosh are $9,468, according to the U.S. Census Bureau. Palo Alto, home to Stanford University, may be a great city for working parents – if they can afford to live there. The median annual cost of housing in Palo Alto is $29,892. That’s the highest of any city in SmartAsset’s analysis. At the same time, Palo Alto also claims the highest median income, at $151,370. Provo’s tech sector has been booming in recent years, which has benefitted more than just the city’s tech workers. Overall unemployment in the Provo area is 2.7%, 10th lowest of the cities in SmartAsset’s analysis. Meanwhile, unlike most other major tech hubs, Provo remains quite affordable. Median annual housing costs in the city are $9,504. That’s less than half the cost of housing in San Jose or San Francisco, which means working parents will be able to devote more of their income to childcare, diapers or trips to Disney World. Of the nearly 450 cities in SmartAsset’s analysis, Edmond ranked sixth for the average graduation rate of local high schools. According to the U.S. Department of Education, the graduation rate in the Edmond Public School District was 96%. Deer Creek Public Schools, which serves neighborhoods along the western limits of Edmond, had an even higher grad rate, at 98%. That makes life a little easier for working parents, who won’t have to stress over finding a good local school for their kid to attend. To find the best cities for working parents, SmartAsset collected and analyzed data on 446 major U.S. cities. We considered the following nine metrics (unless otherwise specified, metrics are at the city-level). Unemployment rate. The average unemployment rate over the three months ending in December 2015 for the county in which each city is located. Median annual housing costs. This includes all costs of owning or renting a home, including mortgage payments or rent payments, utilities, insurance costs and property taxes. Percentage of workers who work more than 49 weeks per year. Average travel time to work. Average high school graduation rate. State policy rating. A score developed by the National Partnership for Women & Families based on state laws regarding things like paid family leave, paid sick days, workplace accommodations for pregnant women and break time for new mothers. Average cost of child care. Calculated at the state level, this is the average annual cost of childcare from childbirth to kindergarten. We ranked each of the cities in our analysis according to those nine metrics (cities in the same state received the same ranking for the two state-level metrics). Next, we averaged those rankings, giving equal weight to all nine metrics. Lastly, we calculated an index score from that average ranking. The top overall state received a 100, while the lowest-ranked state received a zero. Data on unemployment rates comes from the Bureau of Labor Statistics. Data on violent crime rates comes from the Federal Bureau of Investigation’s Uniform Crime Reporting tool, as well as state and local police department websites. Data on high school graduation rates comes from the U.S. Department of Education’s “EdFacts” resource, and applies to the 2012-2013 school year. Data on state-level family policy comes from the National Partnership for Women and Families. Data on the average cost of childcare comes from Childcare Aware of America. Data on the following metrics comes from the U.S. Census Bureau’s American Communities Survey: median household income, median annual housing costs, percentage of workers who work more than 49 weeks per year and the average travel time to work.